We're going to reveal a shocking fashion secret. Right here on this blog. For all the world to see. 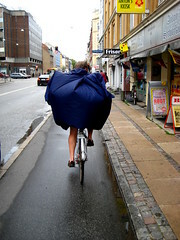 In the closets of most Copenhageners - even the chicest of the chic - there is a rain jacket. Maybe even a pair of matching rain trousers. We don't talk about it much and it's rather uncomfortable mentioning it here but it is true nonetheless. It's our Inconvenient Truth. It's traditionally a rainy climate in the winter. Drizzly, drab and pooey. Only when the forecast is for day-long rain does the rubber come out. 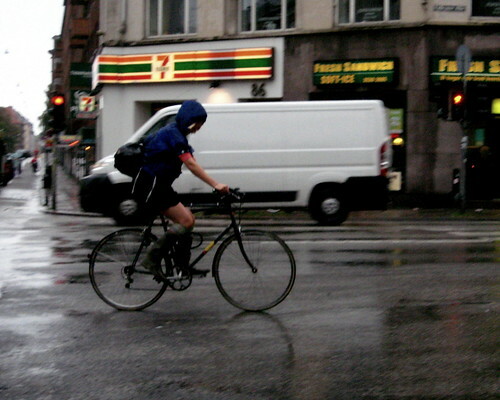 Actually, the Danish Meteological Institute did a study a while back about the odds of cyclists getting rained on during their commute - which is really encouraging. 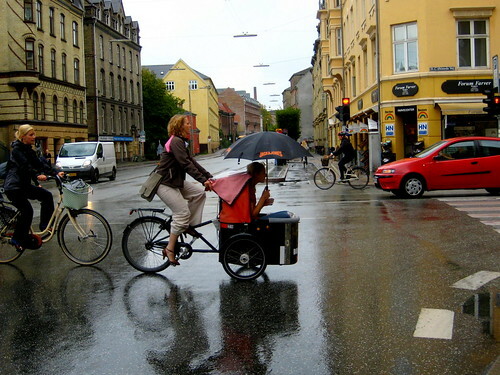 Many Copenhageners aren't THAT fussed about getting bit wet. 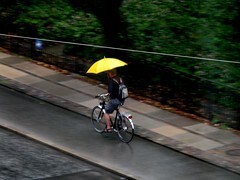 If it pours down all of a sudden, cyclists huddle together under awnings or trees. If it looks like it'll continue, they end up just getting back on the bike and riding away. But just like in most regions, we are experiencing our own weather quirks thanks to climate change. At this time of year we are getting downpours. So much that the sewers in some areas can't handle the water. The other day it rained. All day. Pouring. Old man snoring and all that. And out came the dreaded rubber. However, some cyclists, as the two above, seem to make it work. Wellingtons and rain jackets are suddenly quite fashionable. In light rain, there are options available for friends who are heading out together. Just keep your brolley close at hand. 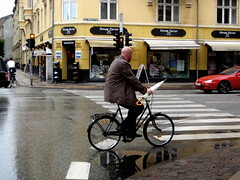 It's an art form in Copenhagen, riding with an umbrella. This Dutch invention would be great here in Copenhagen. 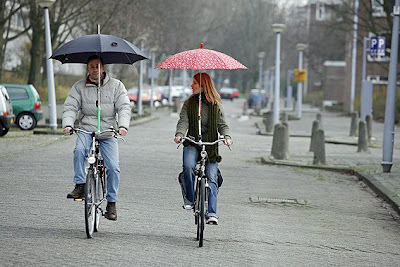 An umbrella holder for your bike from Drybike.nl. More rainy day cycling moods - with music. Not to forget the rain poncho airbag combo. We need those in Auckland, New Zealand. There hasn't been a dry weekend there since April! I like the creative use of ponchos. 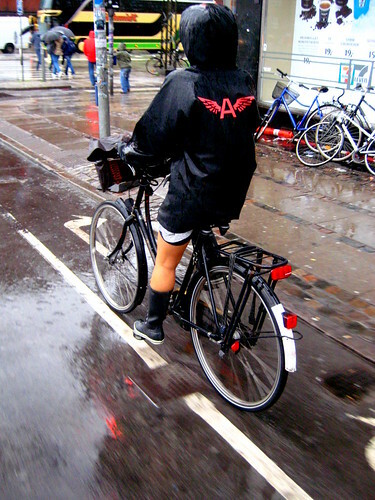 I don't think I have ever seen a Canadian cycle with a poncho! I tried to ride with an umbrella once, inspired by the lovely ladies of CCC. The wind caught the umbrella and almost blew me off my bike. Luckily, I was going slow enough that I could just put my foot down. I think it's extra difficult here in Bloomington because it is quite hilly. It's hard to ride one-handed down a big hill in the rain. I need that Dutch umbrella holder. Oh, I simply MUST have that umbrella holder! Quite ingenious!Here in Boston, we've been having quite some rain this summer, especially mid-afternoon "pop up" thunderstorms. A raincoat is not enough. I love your photos. So beautiful! thanks for the comments! grazie, giorgio! nice to see you here, backpedalbrakes! I'm an umbrella man every time it rains. It's not half as hard as it looks. Wouldn't try it on the road, but around my town [live in England] we have adequate cycle paths. Too bad that the umbrella holder doesn´t really work, it does what it´s supposed to do, don´t get me wrong, but the tiniest but of wind pushes the umbrella (and by default the bike) to the side. I always hold my umbrella in my hand.